We present our Safety First Concept Business Security PowerPoint Templates And PowerPoint Themes 1112.Use our Computer PowerPoint Templates because, Emphasise on any critical or key factors within them. Use our Technology PowerPoint Templates because,And watch them strenthen your companys sinews. Use our Business PowerPoint Templates because,Show them how you can save the day. Use our Internet PowerPoint Templates because, Set out the goals and your plan of action for them. 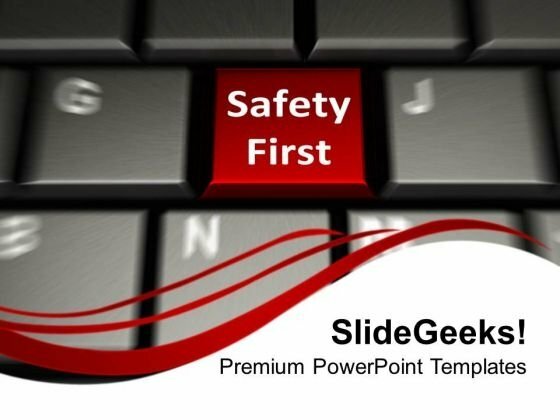 Use our Security PowerPoint Templates because, Clarity of thought has been the key to your growth.Use these PowerPoint slides for presentations relating to "Safety first concept, computer, technology, business, internet, security" . The prominent colors used in the PowerPoint template are Red, White, Black Index your ascent with our Safety First Concept Business Security PowerPoint Templates And PowerPoint Themes 1112. Illustrate every step of the way. Our Safety First Concept Business Security PowerPoint Templates And PowerPoint Themes 1112 ensure your credentials are established. Your abilities will be acknowledged by all.